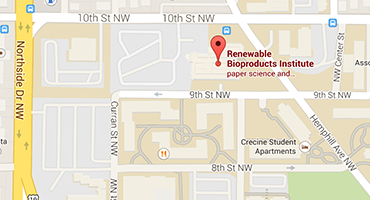 ATLANTA — Georgia Tech’s Renewable Bioproducts Institute set another record this year at its annual executive conference, April 5-6, with registration hitting more than 150, including Tech students and faculty, researchers from a variety of other academic institutions, national laboratory representatives, government agencies, associations and private enterprise. The three-track conference offered faculty and student presentations in Operational Excellence in Pulping, Paper and Packaging; The Future of Biocomposites and Nanocellulose; and New Opportunities in Biochemicals. In addition to the keynote, the conference included 26 faculty and student speakers and 12 from outside Georgia Tech. 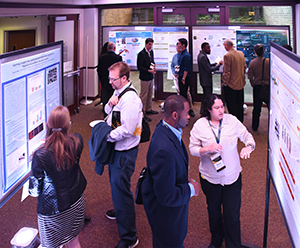 More than 40 graduate student researchers supported by the RBI endowment exhibited their work during the conference poster session, now expanded into two sessions due to demand. The attendance underscores the need recognized by all sectors to share critical needs and learn how Georgia Tech’s innovation ecosystem can address those needs, particularly in the areas of bioproducts and bioprocessing. Kicking off day two’s discussion, Georgia Tech’s executive vice president of research, Steve Cross, cited a dozen companies with an established presence on campus, and urged pulp and paper companies to join them. Cross also reiterated the history of innovation and industry collaboration at RBI itself and its predecessors, which date back to 1929, a “legacy never to be lost,” he said. 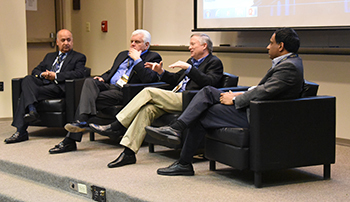 The day’s final session highlighted the ins-and-outs of working with Georgia Tech during an interactive panel discussion. Marsolan laid out RBI’s value to companies, including but not limited to the endowment. He cited an environment to now only partner on research, but take advantage of testing services, develop protocol, sit in on graduate committees and participate in consortiums. Naresh Thadhani, professor and chair of the school of Materials Science and Engineering, along with Sankar Nair, professor of chemical and biomolecular engineering, who also serves as associate chair of industry outreach, both emphasized the need to continue finding new ways to improve processes in traditional fields within the forest industry. 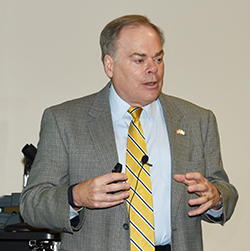 Don McConnell, vice president in Georgia Tech’s Office of Industry Collaboration, agreed, saying there has been an increase in companies engaging in that pipeline, such as locating certain positions and/or departments on or adjacent to campus. “Tech Square is a neighborhood of companies, just like you, from Southern Company to Home Depot, along with visiting scientists and engineers,” he said. “While to some the process of working with a university may seem overwhelming, wondering where they should even begin. We’re here to bring all the pieces together.